I’m not working today (a delayed weekend since I worked Saturday), but I see it’s “snowing” on the FOX12 Weather Blog. That’s a WordPress thing, it’s supposed to put you in the Christmas mood. It is NOT meant to be a secret message forecasting snow in the next few days. I’m taking care of some outside duties since it’s mostly dry today, like fixing a gate and putting a good support up in my flimsy greenhouse so it can withstand much heavier snow this year (not a hidden forecast there either). Last January, I came home at 2am to 9″ of heavy, wet snow. The poor thing had a bow in the middle and appeared to be ready to snap. I yanked the snow off (again at 2am) and it was fine. I want to make sure that doesn’t happen again. Better to do it now then in the middle of a snowstorm or deep freeze. Seems like as I get older I get a little smarter at taking care of things ahead of time. By the time I get to 80 I’ll have it all figured out right? 1. Tonight’s storm isn’t going to be TOO big of a deal; strong wind at the coast, gusty wind here in the Valleys, and lots of rain. But no extremes of any of those. you see the wide variation in temps over us. Specifically look at the afternoon of the 12th; that’s Wednesday 9 days out where the 13DEC line is. 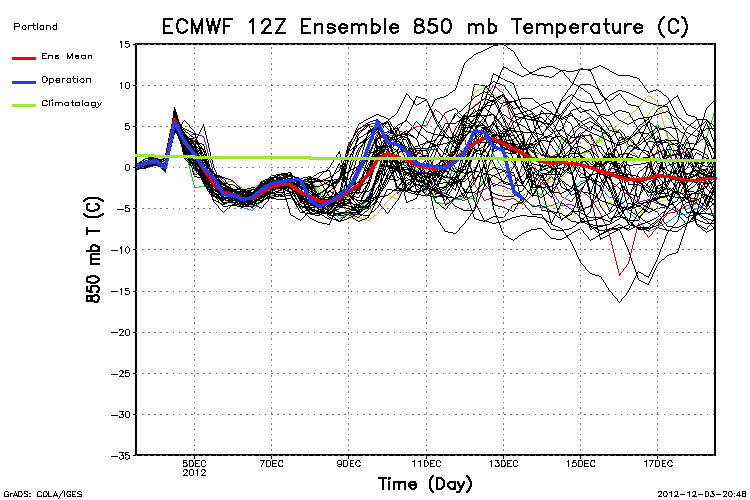 Out of the 51 ensemble members, some have 850mb temps up around +15 and the lowest is around -9. That says to me some have the ridge directly over us and some have it much farther west (allowing cold air to come down from the north). Some of the ensemble members imply a full on arctic blast late next week; look at the -17! The GFS charts are similar, although none of them move the ridge as far to the west so no arctic blast on any of those. 1. I don’t see a setup for snow to the lowest elevations in the next 7 days, but we don’t know beyond that. 850mb temps (-5 to -6) and thicknesses (522-526) sure support snow somewhere below 2,000′ late Friday and/or Saturday with a cool trough quickly moving through. I’m not real confident that even I will see any at 1,000′ at home, but it WILL be the lowest we’ve seen snow so far this season for sure. 2. We could be heading into a real boring weather pattern in the 6-15 day period, or there could be a sudden shift to much colder during the period. We don’t know that yet either. Stay tuned! 3. We are probably done with the storm lows coming in from the west and southwest for awhile once we get beyond tomorrow. A shift toward cooler and at least slightly drier weather is on the way. This entry was posted on Monday, December 3rd, 2012 at 1:54 pm and is filed under Weather. You can follow any responses to this entry through the RSS 2.0 feed. Both comments and pings are currently closed. Low 40s for highs. Mid 30s for lows. Frequent showers but not snow. Models aren’t bringing me hope other than one night of a chance of near freezing temps… Nothing terribly impressive. It’s not even worth looking at the weather for another few days for me… Maybe then the models will bring something, ANYTHING, in. Calm down, relax, and take a deep breath for 00z will bring the goods tonight. Besides it appears the trough this weekend is slightly watered down. Chilly for sure still… Afterwards? It’s better than the EC operational. My point is at least the GFS isn’t wiping out the cold air to the north like the EC does, or show some funky zonal flow, for most of the run it keeps a ridge offshore, but the pattern is too progressive still with no definitive blocking(yet)… 00z in 5 hours! That due does love weather. Yes he does, especially tracking arctic air, ensembles, analogs, indices and other things. Flood watch for all of W. OR. I just don’t see it. Front looks to be thinning out. I got 0.66 of an inch of rainfall between 12am and now. I’d be real surprised if that was the shower that put us in the drink. After last night’s late call for the wind warning, and the flood warning(s), I’m beginning to think it’s bring your kid to work day up there at our local NOAA office. 12z Euro may not have looked good but the Euro ensemble mean about same as GFS at 240h. Nice post, and Mychal Thompson reference. The first ever on the blog. Mychal was 66% from the line for his career. Interestingly enough, he got better from the line after he left Portland. Paul, are you looking at the Euro operational or the ensembles beyond day 10? Just wondering where you are getting your optimism from. There are some pedestrians getting SOAKED as they walk and a car hit a puddle on a flooded street corner!